We were in Amsterdam last year, and had the opportunity to go to the Anne Frank Museum, but I didn’t want to go. I had read the diary when I was a teenager and re-read it some time in my twenties, and I still remember it vividly. I did not think that visiting the house could contribute anything to my awareness of this life cut short by the Holocaust, and I didn’t like the idea of tramping through it with the inevitable horde of tourists. 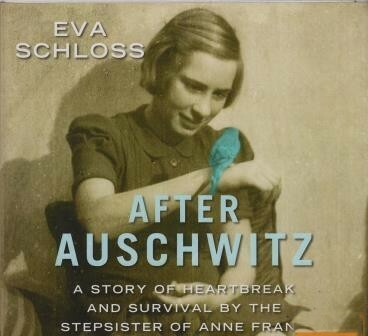 But I was intrigued when I saw amongst the audio books at my local library: After Auschwitz: a story of heartbreak and survival by the stepsister of Anne Frank. Anne Frank died in the Bergen-Belsen concentration camp aged 15 and I knew from the diary that she did not have a stepsister. How could this be? The answer is that Elfriede (Fritzi) Geiringer, the mother of the author Eva Schloss, married Anne Frank’s father Otto Frank after the war. IMO Eva Schloss, a survivor of Auschwitz-Birkenau, is more properly described as the stepdaughter of Otto Frank, but it hardly matters. Because of Otto Frank’s determination that Anne’s story should not be forgotten, her legacy became the focus of their postwar lives and Schloss and her mother continued the work of the Anne Frank Trust after he died. Anne has been an ever-present tragic ghost throughout Eva Schloss’s life. Sensitively narrated by Ann Dover, Eva’s story begins with her childhood in Vienna, where her father was a successful businessman. As Nazi persecution intensified they fled to Amsterdam where they lived contentedly enough in an apartment in Merwedeplein not far from the Franks. The girls were classmates, though not close friends, perhaps because Eva was never as confident or popular as Anne. But when the Nazis occupied Holland, the persecution began again, and before long Jews were in hiding all over Amsterdam. In an effort to reduce the risk, Eva and her mother hid in one place, and her brother Heinz and her father in another where their ‘host’ extorted more and more payment as time went by. Towards the end of the book Schloss talks about the postwar trials of collaborators and I was quite shocked to learn that although there were some who offered genuine refuge at the risk of their own lives, there were also countless heartless scams where Jewish people would pay an intermediary to be escorted to a kindly family willing to take them in, only to find when they got there, that the gestapo were waiting for them. Too few of these betrayers were brought to account after the war. These betrayals led to the entire family being discovered in their seventh hiding place in two years, and they were deported to labour camps in Poland. The chapters about the dehumanising treatment in Auschwitz-Birkenau are harrowing, made bearable only by Eva’s fragile optimism that the family would one day be reunited. It was not to be. Eva and her mother survived thanks to the intervention of a fellow prisoner who was a doctor in the ‘hospital’ and they were liberated by the Russians. But it was too late for her father and Heinz and they did not survive. Heinz was only seventeen but had shown extraordinary talent as an artist, and miraculously some of his paintings were recovered after the war and you can see them on the Eva Schloss website. I have read a few Holocaust memoirs, but few of them have spoken so frankly about adjusting to life in the aftermath. Eva was a teenager who had been through an appalling experience and she found it hard to settle into the normality of school with fellow students who had no idea what she had been through and didn’t want to hear about it either. Most people, she says, wanted to put the war behind them and get on with life. This was impossible for Eva, but she eventually matriculated and then studied art history at university in Amsterdam. It was early in this postwar period that Otto Frank came calling, hoping to hear any news of his missing family. And so it was that Eva’s mother and Otto Frank were united in grief and became a support for one another, with the publication of Anne’s diary to give some meaning to their lives. It was Otto Frank who, with all his family lost, no longer wished to continue his hobby of photography and gave his expensive camera to Eva, who went to London to study professional photography. Eventually she used it to make a career when she was a young mother in London and got the idea of photographing babies in her neighbourhood. But prior to her marriage, there were turbulent years in which she was in conflict with her mother, there was ambivalence about her nationality, and there was paralysing shyness that made it difficult for her to make the friends she so badly needed. There is a poignant moment when she stays overnight in a wealthy home and wakes to find that her gums have bled onto the pristine white sheets. She is too embarrassed to explain that the gum disease is a legacy of Auschwitz, and reverses the sheets so that the blood isn’t visible. And there is also guilty resentment about Anne Frank and the way she came to dominate their family life, overwhelming the memory of Eva’s brother Heinz and also Anne’s sister Margot. Forty years later, it was when the Anne Frank exhibition came to Britain and Eva was asked to speak at the opening, that her life changed. She had made a new life, first as a photographer and then as an antique dealer, bringing up her three daughters with her husband Zvi who was a banker. She had never talked about her experiences, but this exhibition opening was a catalyst for her to begin a new phase of life as an international activist and educator for peace and tolerance. As recently as January 2016, aged 86 she was denouncing Donald Trump for inciting racism but apart from speaking out against bigotry, her work is mainly educating school children about the Holocaust in an earnest hope that it will never happen again. « When is a book challenge not a challenge? Amen to your last remark… not long to go now and I am getting a sick feeling every time I think about it. Yes, I’ve read Primo Levi and yes, that was harrowing but he was alive when I read it. Now when I think of his suicide, I find it truly terrible that such a wonderful person could not live with his memories and his survivor guilt any more, and I don’t think I could read that one again. I am lucky that I have lived side-by-side in a Jewish community where my neighbours were nearly all survivors determined that to live a good life was the best way forward. It’s because their resilience is so inspirational that I read Holocaust Literature, when you might think that there might be, now, nothing new to say. What I find is that each one is different because, of course, each person is different, and the camps do not and should not ever define them. Reading their stories affirms their individuality, and it also reinforces my determination never to let an instance of anti-Semitism or racism go unchallenged. I did it again at a social occasion a fortnight ago, and there was a bit of an embarrassed silence when I challenged what had been said, and then the others supported me, and the racist backed down. Like most people I guess, I read Anne Frank’s Diary in my school days, and made sure my kids had a copy. I’ve listened to it since and I’ll see if my library can come up with the audio version for this one. If not, does your library let you recommend titles that they don’t have? Functionally, our council libraries are all branches of the State Library. Except that Libs decided a good place for cuts would be inter library transfers, since partially reversed. I should hope so too. Interlibrary transfer probably save them money, especially if they charge the consumer for the postage, as my library does. What a beautiful review. It’s true that we read very little about the lives of survivors, in comparison to stories which focus on events leading up to, and while in, the concentration camps. I think of one that comes to mind…”Maus” by Art Spiegleman. Glimpses of his father’s experiences seep through that text. Thank you Lisa for your lovely words. Hello Heidi, I don’t know the one you mention, it’s one I’ll look out for. Though I must say, until I read Sister, Sister by Anna Blay, I hadn’t realised that most of what I’d read was by men, and that the experience of women was different, so I am trying to balance the accounts that I’ve read a bit.